While about half of obesity can be attributed to our genes, and there’s evidence of thrifty genes, it is the Obesogenic Environment or “Toxic Environment” that may be the real culprit. We are surrounded on all sides by energy-dense, heavily advertised, inexpensive, convenient foods. Paired with “Western” lifestyles that have little need for physical labor, car dependency, and the seductive nature of sedentary activities like TV and computers, our physical activity just doesn’t match our caloric intake. Even lights, computer screens and modern business that interfere with our sleep mess with our metabolism. Negative metabolic feedback loops: We know many people can lose weight by decreasing calories and increasing physical activity. 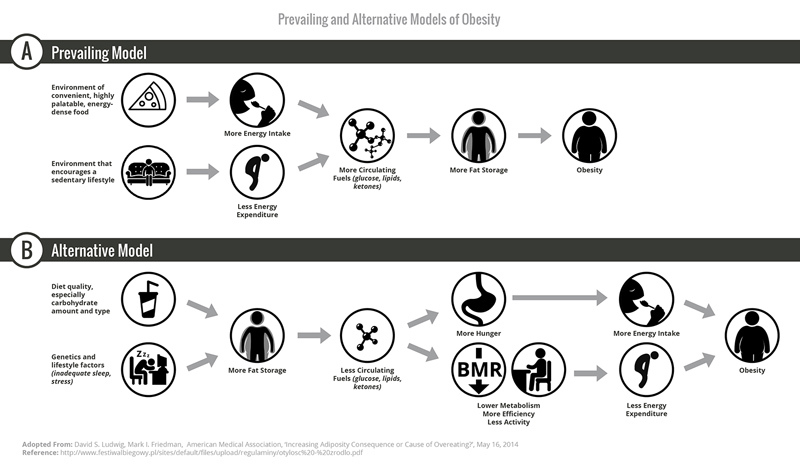 This is the “calories-in, calories-out” model, or the Prevailing Model in the image above. Recent research shows us it’s not that simple. Sugar-rich diets, sleep deprivation, thrifty genes, and less activity create more body fat. And more fat storage results in less circulating fuels. As a result people who are overweight and obese develop a more efficient metabolism (BMR), compounded by more lethargy, and more hunger. It’s a painful Catch 22. One in five people eat one cup of added sugars a day. Every day. We can’t do anything to change our genes but we now know that added, refined sugars are particularly unhealthy for people. Many people at the unhealthiest weights consume the most sugar: 20% of us eat an alarming 721 calories from added sugar every day. At 16 calories a teaspoon, 721 calories adds up to almost one cup of sugar. And most of us have 22 teaspoons a day when the limit is no more than 10 teaspoons. Sneaky Sugars: The only way to eliminate added sugar is to read the labels. It is hiding everywhere, not just obvious culprits like soda and sweet tea, but in sneaky places too, like bread and yogurt. Read the label and check the ingredients list for things like “fruit juice concentrate”, honey, molasses, and corn syrup and ingredients ending in “ose”. They are all added sugars. 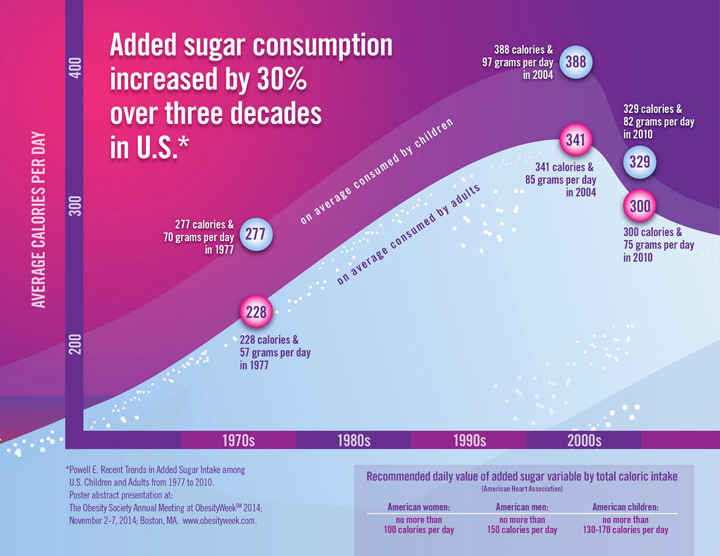 Dr. Tom Warshawski adds a caution about focusing on sugar alone. Where we all agree is that instead of counting calories we need to focus on the quality of the food we consume.